Two weeks ago, I went to see the most recent movie in the apes-versus-humans saga, Dawn of the Planet of the Apes. 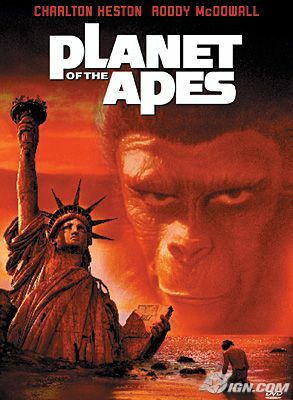 I had no background knowledge of this series, but the film piqued my interest in seeing the original Planet of the Apes film from 1968. Let me note, briefly, that the most recent film has met with critical acclaim for its “visual effects, story, direction, acting, and emotional depth” – all of which are merited (Wikipedia article). If you have the time and the interest, go see it as a decent summer blockbuster; Tom Packham provides a comprehensive review of the August 2014 film here. My focus in this blog post is on the original movie and its allegories. A modern viewer will watch the original Planet of the Apes and think it both serious and silly in equal measures. I laughed when the apes were throwing nets over the stupid human inhabitants of modern Earth. I found it humorous when Charlton Heston threw himself dramatically before the Statue of Liberty towards the conclusion of the film. It all seemed a little cheesy, but at the time I’m sure it was an impressive spectacle for movie-goers. The serious elements of the movie refer to the alternative world in which Charlton Heston’s character, George Taylor, finds himself inhabiting. He has traveled in a spaceship through time, and unknowingly returns to Earth where he and his three surviving crew members crash into a lake upon re-entry. The human population of this futuristic Earth have become dumb, unspeaking animals; in control of the cultural milieu on modern Earth is a hierarchy of apes. The original novel from which this saga sprung, La Planète des Singes, was written by Pierre Boulle and involved an extended allegory about morality (Wikia article). It lacked the science fiction elements which were later introduced by the various screenwriters who haggled over production of the film throughout the 1960’s (e.g. Rod Sterling, known for creating The Twilight Zone TV series, contributed to the written script) (Wikia article). Uniting ideas about morality and science fiction were the allegories which arose in the final film – the denunciation of nuclear proliferation, investigation of religious ideologies, and highlighting of racial tensions (see Palmer, August 9th, 2011). I also saw references to gender inequalities (Nova, the romantic character for Taylor, never speaks) and ageism (Lucius, a young ape, debates the elder’s value system when defending their actions). I think my favorite element of this saga is its questioning of right versus wrong in a state of unclear consciousness. The lines between right and wrong actions are blurred, as they are divided along lines of common ancestry – ape versus human. Consciousness is also unclear; what happens when an ape talks and takes on the hierarchical system of humanity? What happens when human goals are subsumed by another species? As with all science fiction-oriented materials, it shakes up our understood world view and presents us with alternatives not entirely comfortable to the status quo. A great movie, and an intriguing saga, that everyone should watch at least once in their lifetime!